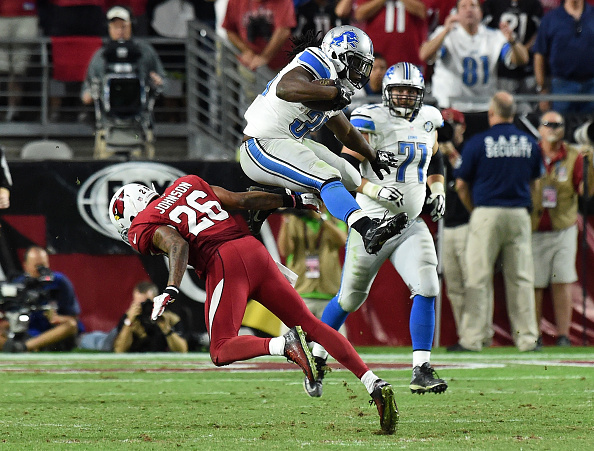 The Lions defense had a bad quarter, and it was the Cardinals defense that shone brighter as they beat Detroit 14-6 to improve to 9-1. For the first time since 2009 the Lions failed to score a touchdown, getting just a pair of field goals from Matt Prater in the setback. The game really came down to the first two possessions, as Arizona scored on each of them, led by new QB Drew Stanton, who is now the starting QB for injured Carson Palmer. Detroit got inside Arizona’s 20-yard line once, and that was after one of Stanton’s two interceptions. The loss snapped a four-game winning streak for Detroit. Stanton threw TD passes of 42 and 12 yards. After that, Arizona’s offense stalled and Stanton threw two interceptions. But the Lions couldn’t convert either turnover into a touchdown. Arizona, with the NFL’s best record, won its sixth in a row and has its best record through 10 games since 1948. The Cardinals also have a three-game lead over Seattle and San Francisco in the NFC West. Arizona held an opponent without a TD for the first time this season. Stanton, 3-1 as a starter this season, finished 21 of 32 for 306 yards. Stafford was 18 of 30 for 183 yards with one interception. Calvin Johnson, usually defended by Patrick Peterson, had five catches for 59 yards for the Lions, only one for 4 yards in the first half. After the game, Johnson was treated for an elbow injury. The Lions were without Reggie Bush and tight end Brandon Pettigrew, and lost right tackle LaAdrian Waddle to an ankle injury in the second half. Detroit did gain 98 yards on the ground. “That was one silver lining,” Caldwell said. It gets no easier for the Lions, who next play at New England against the Patriots on November 23rd.